I was under the impression that Haruhi was a bit of a Deconstruction of a Mary Sue, in a vague kind of sense. /edit Tsuruya isn't a Mary Sue because she isn't, as such, a 'main character'. Maybe she's a Mary Sue in the anime series I am sure which exists in the etheral shadow-realm which focuses on Tsuruya (indeed, I've always been under the impression that Tsuruya has her own anime to which the SOS-Dan are mere background characters) but at least in Suzumiya Haruhi no Yuutsu she doesn't steal plot relevance. ...but at least in Suzumiya Haruhi no Yuutsu she doesn't steal plot relevance. True (so far), but she does steal every scene she's in, novel or anime. ... I very much like that way of looking at. Haruhi has many of the characteristics of a Mary Sue, but is lacking at least one key one: excessive popularity. What is a Mary Sue? I might be wrong, but I believe that is a term that, originally, was used to describe a type of character common in fanfictios: the girl (actually a fictional avatar of the author) that appear reppently in the plot of said anime/book/serie/etc and is bettern then everyone, loved by everyone and solve all the problems that the original main characters couldn't eve dream in solving by thenselfs. Nowadays that definition change a little (as you can see by yourself in the past pages), but is basicaly a character who is irreally perfect and thus/usually boring. But since we don't see that much of Tsuruya, you really don't have any idea what she's good at and what she isn't. Nagato is a more interesting case, and I'd refute Kaisos's claims if I ever tried to read the later novels of Haruhi again; but at this case I'm trying to avoid doing that so I can watch the KyoAni versions. Read the last few pages and read the danm TVtropes article. The Mary Sue definition is so subjective now that your post was absolutelly irrelevant. As you can see, many don't think a Mary Sue must be boring, just that this is the usual. Otherwise, Triple_R, a big Haruhi fan, would never say Haruhi is a Mary Sue. No need to be so harsh, dude. It's not like TVTropes is required knowledge... more like recommended reading. Exept he was quoting my post with the link. Beside, the last few pages was only about it, he should have noticied how that post was meaningless. Out of what was mostly boredom, I went through the trouble of trying to come up with readings for the classmates' names(with the exception of the last one, as I couldn't see enough of it) shown in the Lantis video posted earlier. As I'm most likely wrong on a lot of these, I've also provided the Japanese characters used. If there's more than one name given, it's because there are multiple readings and I wasn't sure which to go with. No, I'm not really sure why I'm posting this. Just figured it'd be a mildly amusing point of discussion on characters that never get any attention. WARNING: Kogetsu Shirogane cannot be held accountable for any actions taken by someone else. Potential side effects of communicating with this user include headaches, mild confusion, insanity, delirium, and jumping into fires. Do not expose this user to sunlight or water or feed this user after midnight. I am sure someone, somewhere will find it useful. They are an exelent material for fanfiction. But where did you find these readings? All names can have multiple readings you know (not to meationing nultiple ways to writethe sane reading, like Oonoki/Onoki). I am not even sure if the ones posted in the first page are correct. Anyway, my rikaichan say it is everything (possiblely) correct. Exept there is a lot more readings you didn't listed. Also, apparently, Takano's given name an be 'Sachina', 'Yukina' or 'Yuna'. But, wait a minute. 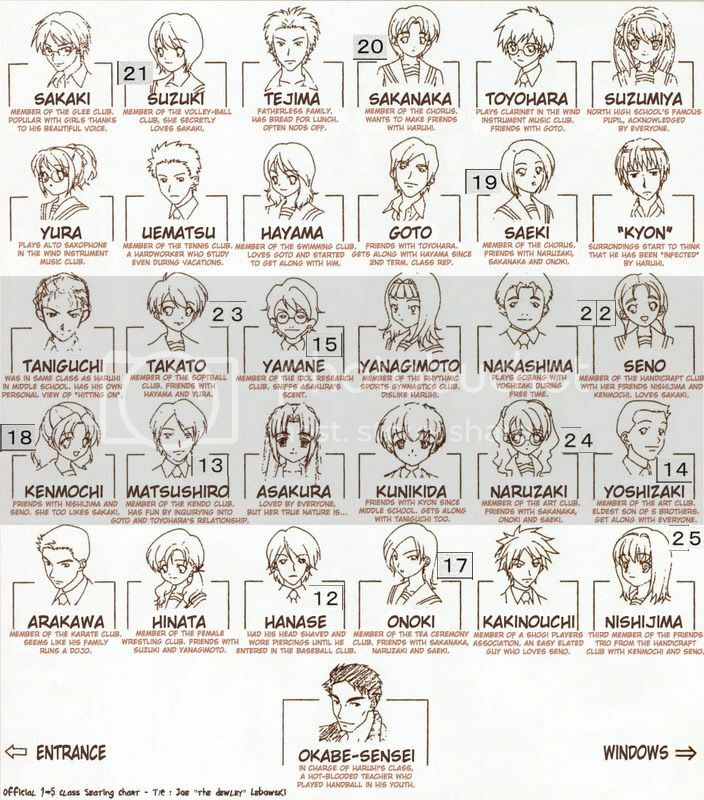 That mean that even the random classnate have full name but Kunikida and Taniguchi don't? Also, forget these two, how about Tsuruya and Sasaki? Where the hell did you find it, by the way? The surnames were taken from the seating chart I had, the given names were through an annoying process of trial-and-error with the kanji. "Miharu" is in hiragana, so there shouldn't be any alternate readings. No, I mean, where did you find these given name kanji in the first place? I didn't know they did even exist. The attendance list was shown about a minute into the Lantis video posted in the movie thread. With two exceptions(one is a spoiler and the other I couldn't see enough of to figure out), I have every name listed. 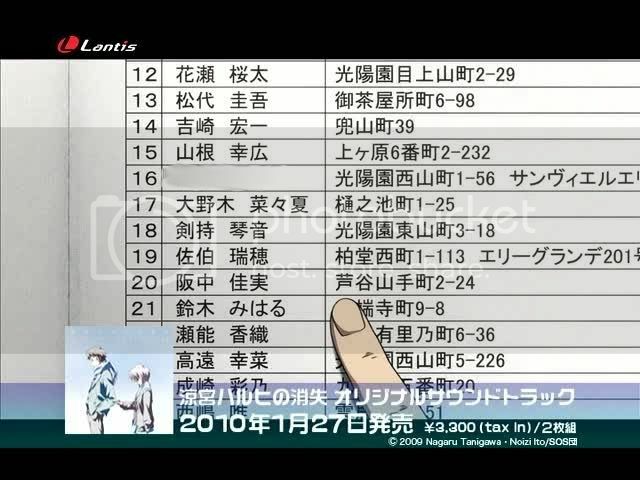 To follow up on Kogetsu's hard work (and thank you very much for translating the names, I know there's some of us who do appreciate the hard work), here is the translated seating chart with the numbers listed from the spoiler video. The awesome translated seating chart is spoilered due to size and I'd like to thank an awesome mod, CrowKenobi, for sharing this picture I'd been hunting since the spoiler video was released and couldn't find. I've blurred the name that Kogetsu left out, so no spoilers (though it's not really much of one all things considered). So, Sakanaka finally has a first name, eh? Awesome. Good job Kogetsu and ultimatemegax! The awesome translated seating chart is spoilered due to size and I'd like to thank an awesome mod, CrowKenobi, for sharing this picture I'd been hunting since the spoiler video was released and couldn't find. I'm really, really flattered, however, I have as much power in this forum as yourself... all I do is help with the posting of torrents on animesuki.com. All times are GMT -5. The time now is 11:29.